At SteamCon UK last November we revealed to you the first of the Minor Guilds, the Ratcatchers. Since then we’ve been pretty quiet on the subject of the Ratcatcher’s Guild, but today that comes to an end. As the release of the first Minor Guild draws ever closer, it’s time to start talking to you about some of the new characters joining the Guild Ball universe and some of the awesome new things they can do! Today, we’re going to talk to you about the genesis of the idea of the ‘Minor Guilds’. What is a ‘Minor Guild’? If you want to read the story of the Union’s untimely end, you can find the link here. The ‘Minor’ Guilds are Obulus’ answer to the rising aggression of the Church. The Church have systematically dismantled the Union, and in doing so removed a key resource that ‘Major’ Guilds like the Morticians had come to rely on. Obulus decided that he needed a new pool of resources from which to draw extra players and other minions when he needed them. So, fatefully, he formed an alliance with a previously lower league team, the Ratcatcher’s Guild. In gaming terms, Minor Guilds are a whole new set of standalone teams that you can choose to play with. Each is a legal team in its own right. As an example, the Ratcatcher’s Guild box will include a Captain, a Mascot, and four other players, all you need to play a game of Guild Ball! All of the currently existing Guilds (like the Butchers, Fishermen etc) are now classed as ‘Major Guilds’. Every Major Guild can expect to eventually receive a Minor Guild. Two players in each Minor Guild will be ‘dual Guild’, meaning that they can play for both the Minor Guild and the Major Guild. In the case of the Ratcatchers, Skulk and Pelage are the two dual Guild players, they can play for either the Ratcatchers or the Morticians. When playing for either Guild, both Skulk and Pelage will be friendly Guild models, in much the same way that Compound is a friendly Guild model to both the Alchemist’s Guild and the Engineer’s Guild. Additionally, two existing players in each Major Guild will become dual Guild. In the case of the Morticians, Bonesaw and Veteran Graves are the two dual Guild players. 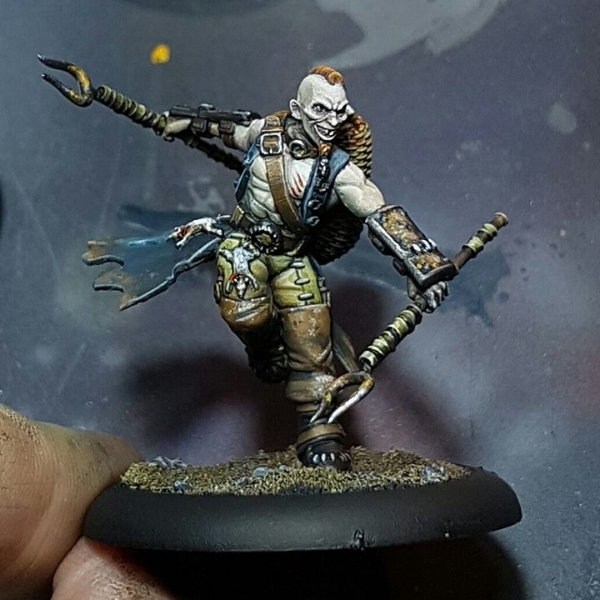 This means that they can play for either the Morticians or the Ratcatchers, and they are friendly Guild models to both! For Ratcatcher’s Coaches, all this means that they will have eight models to choose from when they play each game; the six from the Ratcatcher’s box, plus Bonesaw and Veteran Graves. Don’t own Bonesaw or Veteran Graves? You need to make sure you attend a Ratcatcher’s Launch Event where two of the exclusive prizes are alternate sculpts of Bonesaw and Veteran Graves! A last thing to note regarding player selection for gameplay. On the retail release date of each Minor Guild, the corresponding Major Guild will lose the ability to play with Union players. This means that from the release date of the Ratcatchers, the Morticians will no longer be able to play with any Union players. This is why Obulus wanted to set this up so badly! The story of the Ratcatchers, and in fact all of the Minor Guilds, stretches back to the ‘Design a Model’ seminar series that we ran at SteamCon UK in November of 2016. We started from nothing at all, and through working together with the attendees of those seminars we created the initial idea of the Ratcatcher’s Guild and Skulk as its first player. Lead Sculptor Russ Charles then created a render for Skulk, we 3D printed the render, and attendee Trent Denison used the final day of SteamCon to do an incredible job painting the first ever Ratcatcher model. All of that from just three days is a remarkable achievement that we can all be incredibly proud of. After SteamCon 2016 we spent a lot of time trying to decide what to do with Skulk, as well as the idea of the Ratcatcher’s Guild. After a lot of discussion between the development team we settled on the idea of the Minor Guilds. This is a way to let us explore the smaller Guilds from the Empire of the Free Cities, some of which you will have seen mentioned within the Guild Ball backstory. So in many ways the future of Guild Ball was quite literally shaped by the attendees of SteamCon 2016. In other words, by you the fans! The Disease condition is the first of its kind, a condition which spreads all on its own without needing help from players. Normally inflicting a condition like burning on an enemy team requires the use of a Character Play like Fire Blast or Flame Jet. However, once one player suffers the Disease condition, it may not be long until everyone else catches the Disease! If your own players are suffering the Disease condition, you can pass it to enemy players just by sprinting next to them! Players suffering the Disease condition will slowly lose health points each turn until it is removed and the cost of healing by spending Momentum is significantly increased. What often happens is that very few players can afford to spend the Momentum required to recover health points, and often it isn’t worth removing the Disease condition because it spreads so quickly. This leads to everyone on the Pitch slowly losing health and games ending in a flurry of desperate goals and take outs. In this way, the Disease condition almost represents a unique ‘scenario’ when playing with or against the Ratcatchers. Both teams are going to have to change their tactics to have a chance of victory! However, we wanted to make the Disease condition an optional part of the Ratcatcher’s play style. The way we did this is by only putting abilities related to the Disease condition on two players, Scourge, and Miasma. This means that if the Ratcatcher’s coach doesn’t wish to use the Disease condition in a particular game, they can choose to play with Piper, Squeak, Pelage, Skulk, Bonesaw, and Veteran Graves, none of which have abilities directly related to the Disease condition. That it for today folks, check back next week to see the reveal of the next Ratcatcher character card: Pelage, The Dark Seductress.